Swimming with manatees, kayaking, biking, hiking… with all that there is to do in Florida’s Crystal River area you are bound to get hungry! We’ve put together this list to ensure you stay fueled up for your next adventure. Food trucks are growing in popularity in Crystal River! While we were visiting Three Sisters Springs, we stopped to get some tacos at the Jarrito Burrito Food Truck. They had a variety of tacos, burritos, nachos, and desserts and everything was made fresh. We purchased a steak taco and that steak really had a lot of flavor! Right in the heart of Heritage Village in downtown Crystal River is Tea House 650. This adorable cafe serves a variety of teas (over 50 loose leaf teas), as well as wine, food, and household accessories. There is both inside and outside seating, but we chose to sit outside on the front porch. Tea House 650 is on North Citrus Avenue, the main street of Heritage Village, so it is a good place to sit and people watch. While we were there, we had the Golden Monkey tea and the 3 Cheese Flatbread. The tea was sweet and refreshing, which was perfect after having been exploring the area all morning. The flatbread was really good too but the star of the show was definitely the warm raspberry jalapeño compote that came with it. It had just the right amount of kick to it and accompanied the flatbread beautifully. Just south of Crystal River is the Riverside Crab House in Homosassa. This restaurant is right on the water and offers it’s guests a large menu of fresh caught seafood, with their specialty being blue crab. They also have a tiki bar next door, Monkey Bar, that you can order drinks from to accompany your food. While you wait for your meal or drink, you can see boats and kayakers go by or you can watch the playful monkeys on Monkey Island. Yes, you read that right! The story of Monkey Island is pretty interesting… In the 1960s, there was an area of rocks in the river that hid just below the surface of the water during high tide. Boaters often wrecked on these rocks so G.A. “Furgy” Furgason, owner of the land, left instructions for dirt to be piled on top of the rocks. Turns out they put too much dirt! And it didn’t look pretty. Meanwhile, some mischievous monkeys that kept getting into trouble at a nearby wildlife attraction needed a new home. So, huts and plants were added to the island and the monkeys were transported over. Three out of the original five monkeys are still living on Monkey Island. The other two passed away of old age in the early 2000s, but two more have been brought in. Visitors can see the monkeys swinging on ropes and playing around, all from inside the restaurant! Once the food comes, though, your focus will definitely shift. To drink, we had Monkey Juice which had spiced rum, coconut rum, peach schnapps, banana liquor, orange and pineapple juice, and a splash of grenadine. As an appetizer, we had Conch Fritters which were breaded really nicely. And for our main meal we had a Basket of Fish Fingers which came with french fries, hushpuppies, and coleslaw. The fish was fresh and the french fries were crunchy and spiced especially well. Pro Tip: Go just before sunset; the views from the deck are beautiful. During our stay in Crystal River, we stayed at Plantation on Crystal River. Inside the resort is West 82º Bar & Grill. We actually ate at the restaurant a couple of times, one time for breakfast after swimming with manatees and then another day for dinner. The restaurant is open and airy, with views of the pool area and Kings Bay. During our first visit, we had the Banana Stuffed French Toast for breakfast. The bananas were cooked in the baguette bread, which we’d never seen before. It was topped with powdered sugar and pecans. We loved the bread and the combination of bananas and pecans. When we went back for dinner, we were pleasantly surprised to start our meal off with some yummy cornbread. As an appetizer we had the Caprese Salad which had yellow and red tomatoes and fresh mozzarella. For our main meal we had the Grilled Filet Mignon which consisted of an 8 ounce tenderloin with green peppercorn demi-glace, tri-color fingerling potatoes, and vegetables. The tenderloin was cooked just the way we liked it and the potatoes were really good. I thought the vegetables could have used a little bit more salt though. For dessert, we had the Rum Flan. Besides the food and views, what impressed us about the restaurant was also the service. You don’t have to be a guest of the resort to eat here, and we could tell that locals eat at the restaurant often. The staff and guests greeted each other warmly and it was obvious to see who the regulars were when they sat down. Another great place to eat in Homosassa is The Greenhouse Bistro & Market. They focus on using locally-grown, sustainable, organic ingredients and their food is made in-house, which includes their dressings, sauces, and even condiments. We loved the decor as soon as we walked in and had a hard time choosing whether to sit inside or outside. Since it was a beautiful day, we ended up sitting outside. We were happy with our choice because we ended up having a view of their butterfly garden (I was told they’d soon have finches too!). We were there for Sunday Brunch and started our meal with a delicious Guava Mimosa. Pretty soon we were devouring our Bistro Benedict, which had sweet potato, spinach, tomato, local duck eggs, and hollandaise sauce. OMG, those sweet potatoes! That was the best benedict we’ve ever eaten, by far. And it was the perfect portion too, because we were still able to fit in some Chocolate Chip Cheesecake afterwards. We must also note that most of the items on their brunch menu were gluten-free. Another important element of The Greenhouse Bistro & Market is their connection with nature and the local area. They have a Farmers Market where they sell fresh produce from local vendors and are planning to open a bakery, brewery and beer garden, pizzeria, creamery, and health food store. The Halls River runs behind the restaurant as well, and they’re the only ones with access to that section of it. There are no homes along the river there so it’s quiet and secluded, and The Greenhouse rents kayaks so you can enjoy this part of “Old Florida.” We can’t wait to go back and see all of the additional things they plan to do in the area! Hi Danik! Yes, it was all very delicious! I tried to go to Crystal River and it was closed. We went to Juniper Springs instead. I was super disappointed. But now I know exactly where to eat when I actually get to swim with the manatees! All the food looks great, but I can’t get over the steak taco. OMG, how delicious it looks. 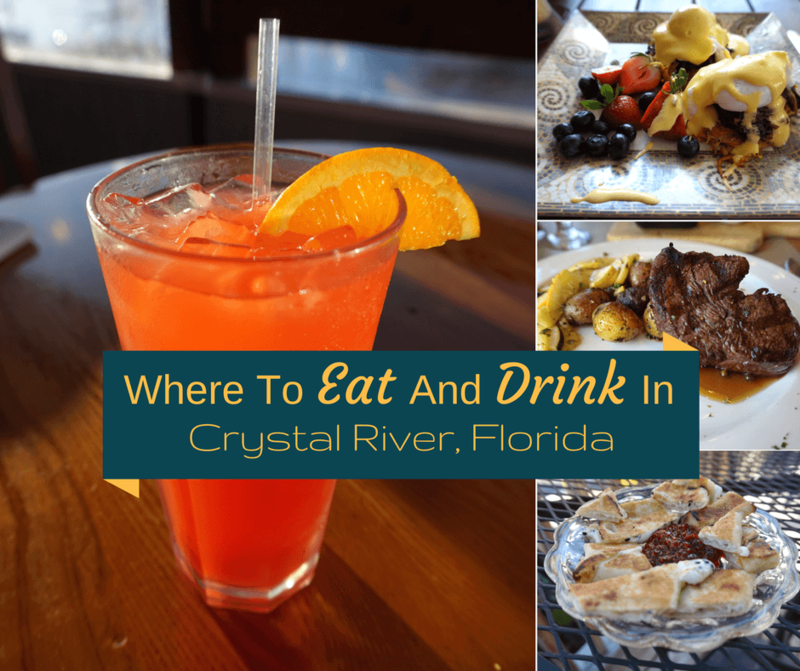 Crystal River seems like a great place for foodies. That is a good choice of places to eat and drink. Hard to choose one though. Great food photography done. This all looks so good. That monkey juice would really hit the spot right now and who wouldn’t go for grilled fillet. We have a plant site in St Petersburg that I’ll end up visiting sooner or later. I’ll have to make it over to Crystal River and try a few of these treats for myself. Looks like there are a lot of good places to eat…for different budgets…in Crystal River, Florida! Oohh. Some great options to choose from. Hard choice from a burrito from the food truck or a beautiful setting at the Greenbelt. Think I’d have to fit in both. Some other great eats are Crackers and Charlies Fish House both on the water and Dan’s Clam stand on hwy 44. The Crab Plant, The Freezer, Fat Daddy’s (best ribs) , The Seafood Seller and Vintage on Fifth are also a must try. Oh wow! I’m feeling full already! lol Thanks Carol! Thank you, Carrol. I could not believe she did not mention SeaFood Cellar or Brothers Pizza! All of these look really great- especially the taco truck. Living here in Thailand sometimes it can be difficult to find really good Mexican food. Greenhouse also looked great! I would love to try it. Another fantastic restaurant to try when in the Crystal River area is Pecks Old Port Cove in Ozello, Fl. (Ozello is a small fishing village on the Gulf of Mexico located between Crystal River and Homosassa. Simply turn on Ozello Trail and follow it until you see the Gulf of Mexico.) Super fresh seafood, and a warm, cozy restaurant. They also have a Tiki Bar outside for when the weather is good. This is where we always take friends and family when they visit, and they always want to go back. My family runs one of the Dive Shops/Manatee tour companies in Crystal River and have had so many people call back to thank us for sending them to Peck’s.